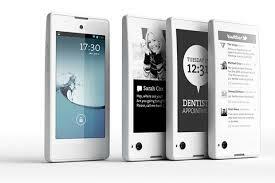 YotaPhone, the LCD/e-ink hybrid launches in Moscow next December 4th. This strange device has an LCD display on one side and black and white e-ink display on the other, without any traditional Android buttons. Dual-screen smartphones are nothing new, but YotaPhone is the first device that packs both a traditional LCD front and an e-ink back. It has both sides coated in Corning Gorilla Glass 2, with a matte texture in the back side, the e-ink display. The YotaPhone has thus a quite unique look, more pronounced by its slightly curved back. The device runs Android Jelly Bean and it’s powered by a dual-core Snapdragon S4 CPU running at 1.5 GHZ. In its backside, it has a 12 MP camera, and the power button doubles as a SIM tray. The screens are 4.3-inch, with a resolution of 1280×720 pixels for the LCD display.The YotaPhone doesn’t have the traditional Android buttons. Instead, you can activate the button commands with gesture controls on a panel under the LCD. The e-ink panel saves battery and provides a more comfortable reading experience even in bright sunshine. 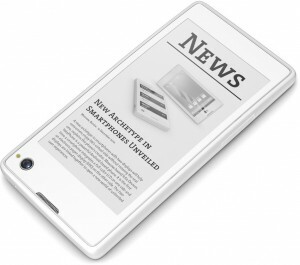 When you flip the phone, the footnotes present in the page you were reading in the e-ink panel will automatically appear on the LCD. The e-ink display can be used for a comfortable reading but also offers a lot of non-conventional uses, such as: • Messages. When a message appears on the second screen, it remains there until you need it. • Meetings. You can see a full list of your booked meetings. • Calls. The reminder of a missed call will be stored in the back panel. • Calendar and weather. A full view of your calendar can be displayed, as well as the weather forecast. • Reminder. They will be displayed permanently so you can always have a look at your matters. You can find more information at YotaPhone.